No professional experience? No problem. Learn how to write your internship resume with these writing tips and sample. Or, save time by using our quick resume builder. Energetic and passionate college student working towards a BS in Marketing at the University of Georgia. Aiming to use my knowledge of advertising, PR, product development, and consumer research strategies to satisfy the marketing internship at your company. Managed all of the marketing aspects of the business plan including industry analysis, customer trends, market growth, positioning, and promotions. Every great resume needs a hook. Job seekers have a variety of options when it comes to starting a resume, but for students, a career objective is often the most effective. Unfortunately, there is a huge misconception surrounding the use of career objectives. Despite what some may say, a career objective is NOT a statement telling the employer what you want from the company. Instead, the goal of an objective is to explain what you bring to the table and how you can help the company meet its goals. Hard-working student (3.8/4.0 GPA) who is driven and can meet strict deadlines. Seeking to apply my strategic analytical skills to the reporter/research internship at your newspaper. Possess proven writing and research abilities that will aid your company in achieving milestones. Energetic and passionate college student working towards a BS in Marketing at the University of Georgia. Aiming to use my knowledge of advertising, PR, product development, and my consumer research skills to satisfy the marketing internship at your company. As the two samples above demonstrate, a strong career objective gives companies a glimpse of what you can bring to the table, thereby hooking them in to read more. Short, persuasive, and concise, the Career Objective is a classic way to start a powerful resume. Make sure you get it right with our helpful Career Objective Writing Guide. Normally, education sections land near the bottom of resumes with very few details. For experienced professionals, this section of the resume is not as significant as the applicant’s professional experience. However, for student resumes that lack professional experience, the education section is a major point of emphasis. GPA: Including your hard-earned GPA tells the manager that you can be trusted to produce quality work on a deadline. It’s important to note that job seekers should only include their GPA if it is a 3.o or above. Relevant Coursework: Listing your courses will give the employer a better idea of the knowledge and expertise you possess. Remember to only list classes relevant to the job you are applying for. Honors & Awards: Adding any awards you received in school will show the HR manager that others recognize your hard work and accomplishments. Extracurricular Activities: Including activities like clubs and sports demonstrates additional skills (leadership & communication) that you might have. Remember that the education section is the cornerstone of a student resume. Since you will likely have little or no professional experience, feel free to fill your education section with a wealth of information. Visit our guide on how to write an education section based on experience if you need more advice. Including a Major Achievements section will help you expand on the highlights of your educational experience. 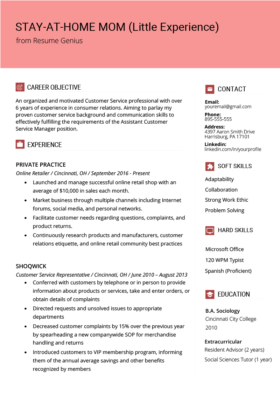 The hardest part about writing a high school resume or a college student resume is simply trying to fill up the page. Most students hit a wall when it comes to the professional experience section because they simply don’t have relevant work experience. Luckily there is an easy way around this obstacle. Students can substitute the professional experience section for a “Major Achievements” or “Major Projects” field. Including one of these categories will help you expand on the highlights of your educational experience. Students can elaborate on just about anything in these sections. Yet, it’s best to stick to topics that are relevant to the internship and that will help the employer understand how you will perform at their company. In general, high school students tend to focus on their club participation while college students often incorporate major class projects. What is the format of a Major Achievements section? If you want to take this section a bit further, it’s always nice to include numbers on your resume like the candidate above. Numbers help employers to illustrate and measure your skills. While the Major Achievements and Major Projects sections are just extensions of your education, they can help your resume by giving off an impression that you are an experienced candidate.